I’m not a really good driver. Take the first time I rented a car for instance. I had wrecked my own car within the first week of owning it but I needed to go to a festival the weekend following my wreckage. So I rented a car and responsibly stopped at the gas station to fill up my tank before I hit the highway. The problem came into play after I paid for my fuel and I was trying to leave. There was a LOT of traffic. With each passing minute of watching cars whiz by the exit of the station, I began hyperventilating a little bit more. Except it was worse. And there were a lot more witnesses. 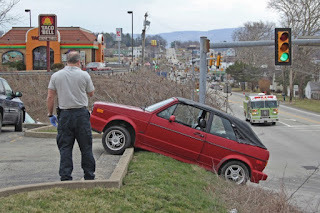 Anyway, to make a long story short my car only moved far enough to hang midway across a large cement block – the front facing into traffic, the rear safely dangling in the softly glowing lights of the gas station. I didn’t immediately understand what was happening. I knew I wasn’t moving anymore. My gut told me that I was in a pickle but I couldn’t fully comprehend why. Eventually I got out of my rental car to investigate. I walked around it a few times. I wasn’t sure what I was looking for but I expected there might be some type of damage. I didn’t find any and after I was done looking I wasn’t quite sure what to do next, so I got back into the driver seat and sat there for a bit longer. After awhile I figured that I should call someone. I didn’t own a cell phone at the time so I scrounged around my bag for change to use at the payphone. After that, I had to make a decision about who I might call. My father? He would just yell. A tow truck? How would I get a phone number for one of those? A friend? They would all laugh at me and offer no useful advice. I was in the middle of this train of thought when I was startled by a knock at my window. I looked up to see a man’s face just inches from my own. I rolled down the window. Man: Do you need some help? Me: Oh my god, do you think you can help me?!? Man: Yes ma’am, I think I can. Put your car into neutral. Man: The “N” on your shifter means neutral. Then he proceeded to walk around to the front of my car and try to lift it up and over the large curb that it was resting on. Clearly that didn’t work. Because he was a person and people can't usually lift cars. But then three body builders walked onto the scene. Body Builder 1: Excuse me ma’am. We noticed that your friend here couldn’t lift your car on his own…but maybe he could do it with our help. 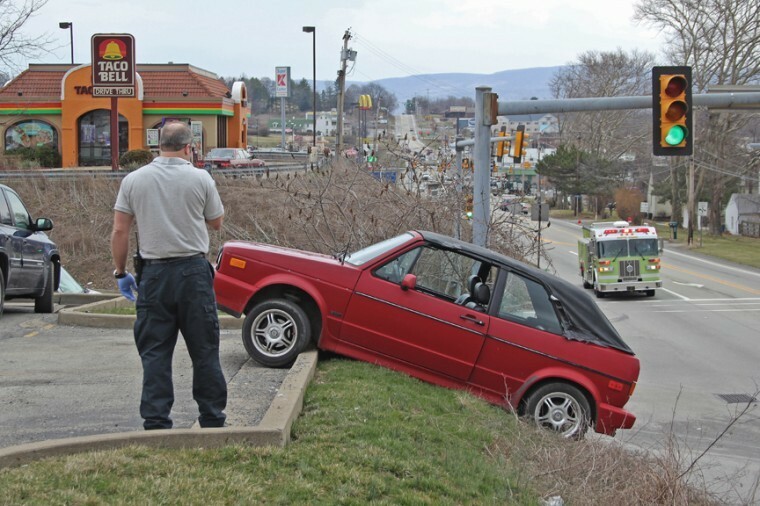 I thought for a second that I was on that 80’s show, Candid Camera, but then I remembered that nobody could have possibly set me up to drive my car over a curb into oncoming traffic. After I decided that I wasn’t on National television, I curtly nodded my head yes to the body builder. And the four men saved me. The point of my story is that I never learned my lesson and I’m still a bad driver. Lmao!!! I remember this. Ahh, good times. Sometimes driving is really hard. Hahah...I like to picture you getting out and taking a look-see. Whatever that would of accomplished! I appreciate your sense of personal responsibility in public. I figured it was the only logical thing to do at that juncture in time. I always try to appear responsible in public when I do stupid things. It's best.